Che L, Way E. Case report: Autoimmune hemolytic anemia. Poster session presented at: Annual Educational Conference of the UC Davis Network of Affiliated FM Residency Programs. 2018 February 24 – 25; Sacramento, CA. Moheyuddin A, Che L, Sandhu S, Parsa E. "No Time for Tea": a precipitous case of ANCA negative RPGN. Poster session presented at: Annual Educational Conference of the UC Davis Network of Affiliated FM Residency Programs. 2018 February 24 – 25; Sacramento, CA. Yep J, Che L, Adeel M. "I cannot feel my feet anymore. "- A Case Report of NF Type 1. Poster session presented at: Annual Educational Conference of the UC Davis Network of Affiliated FM Residency Programs. 2018 February 24 – 25; Sacramento, CA. Assibey R, Johl R, Yep J. “SBP or Not To Be? That is the Question”. Poster session presented at CAFP: Family Medicine clinical forum, April 13-15, 2018; Monterey, CA. Was awarded for best 2 minute 2 slide presentation. Moheyuddin A, Jain M, Oishi P. “A Case Report: Polyseptic Arthritis in an 8 yr old to disseminated MRSA complicated with purulent pericardial effusion and multifocal muscular abscesses”. 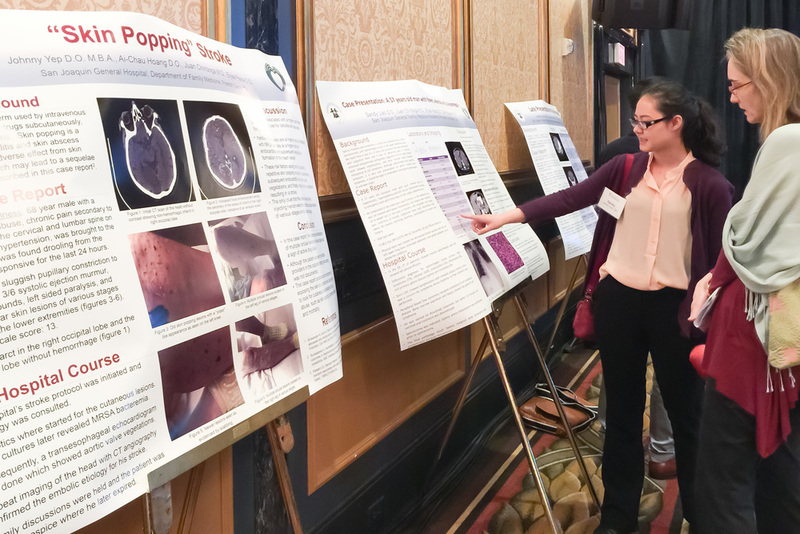 Poster session presented at CAFP: Family Medicine clinical forum, April 13 – 15, 2018; Monterey, CA. Moheyhuddin A, Smith, Grace J. A. Efficacy of Universal PHQ-9 Depression Screening in Primary Care Medical Clinic. Poster session presented at California Psychological Association, April 26 – 29, 2018; La Jolla, CA. Case Presentation: 60 Year Old Woman with Sudden Blurry Vision: Internuclear Ophthalmoparesis in Granulomatosis with Polyangiitis. Sandy Liao, D.O. ; Donald Powell, M.D. ; Asma Jafri, M.D. Case Presentation: Late Presentation of Uterine Rupture. Sabhrup Biring M.D., Spencer Wong M.D., Imad Kafilmout M.D. Case Presentation: A 57 year old man with fever, anemia, and splenomegaly. Sandy Liao D.O., Juan Chiriboga M.D., Elyas Parsa D.O., Tam Nguyen M.D. FP Essentials: Dermatology Procedures December 2014. Tam Nguyen, M.D. FP Essentials: Skin Conditions April 2013. Tam Nguyen, M.D., Ramiro Zuniga, M.D.